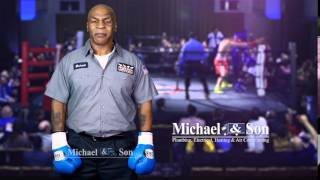 Count on the plumbers at Michael & Son Services to take care of basic and advanced water line repairs for your Petersburg, Midlothian, or Glen Allen home. Access to running water is important for completing many daily tasks, such as gardening, cooking, and cleaning. If you do not have proper access, your life will be put on hold. Contact us to choose our services today. Our Sewer & Water Line contractors guarantee that they will meet all of your plumbing needs to make your home life convenient and comfortable. We have spent more than 30 years providing plumbing services to the community and have a good reputation for offering personalized customer services, as well as magnificent installations. It doesn’t matter if you need sewer line repair or water line replacement services, we work hard to make sure the done is done quickly and efficiently. Furthermore, our plumbers always clean up after themselves. If you call us up at (804) 335-1677 or send an e-mail with a repair or replacement request, our staff will be able to help you. You can receive repair services during our regular business hours or you can take care of the problem tonight with our 24-hour emergency services. We are proud to help individuals with sewer line problems who live in the Chesterfield, Richmond, Mechanicsville, or Chester areas.